Heriot’s returned to the top of the BT Premiership with a hard fought 23-14 win over previously unbeaten Boroughmuir in a bruising encounter under the lights at Meggetland last night. The defending champions built the victory on a powerful showing by their pack and their more clinical finishing. The visitors also scooped the Clark Cup – a trophy at stake in the first league meeting of the sides each season – and the Bill McLaren Shield which had been in Muir’s possession since their win at Melrose. Heriot’s opened the scoring with eight minutes on the clock when recycled ball was shipped across the field to Rob Kay who touched down in the corner for an unconverted try. 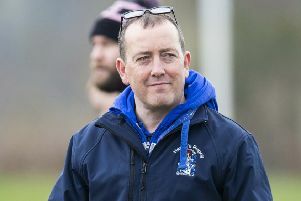 The visitors had the upper hand in the forward exchanges and an offence at a scrum by a creaking home pack allowed Graham Wilson to atone for the missed conversion by adding three points to his side’s tally. Muir battled back and a drive following a close-range lineout ended with Craig Bachurzewski touching down. Dougie Steele added the extras to trim the deficit to a single point. However, within a couple of minutes, the visitors had responded with another five pointer, this time from John Semple who darted in following a quickly taken penalty. Muir attempted a reprise of the move that brought their try, but the Heriot’s defence held firm and it was the visitors who ended the half the stronger of the two although a series of scrums inside the home 22 failed to yield any further points. Wilson booted a second penalty five minutes after the restart but was off target with his next attempt, offering some hope for Muir who were playing the better rugby at that stage. And after surviving another assault on their line, the hosts hauled themselves back into the contest when a sniping run from Jonny Adams was thwarted just shirt and Robbie Wilson completed the job. Steele’s conversion cut the deficit to two points, 14-16. However, five minutes later, Semple ghosted through the home defence for his second converted try to seal the win. Boroughmuir: E Farquharson, C Hunter, A Cox, G Cannie, Rik van Balkom, D Steele, R Smith, R Wilson, S Crombie, C Bachurzewski, I Moody, S Gibson, M Bradbury, A Rose, C Reid. Subs: D Robertson, C Davies, S Burnside, J Adams, M Hare. Heriot’s: J Semple, J Rae, M Learmonth, C Ferguson, R Kay, S Edwards, G Wilson, M McCallum, M Liness, S Cessford, R Nimmo, R van Heerden, J Turley, S Dewar, J Hill. Subs: S Mustard, M Boab, I Wilson, H Fraser, G McNeish. Boroughmuir: Tries – Bachurzewski, Wilson; Cons – Steele (2). Heriot’s: Tries – Kay, Semple (2); Pens – Wilson (2); Con – McNeish.